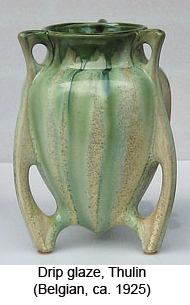 Emons & Sohne (1921-1974) was not widely known for a long time except for a few forms and glazes. The problem was that they almost never marked items. 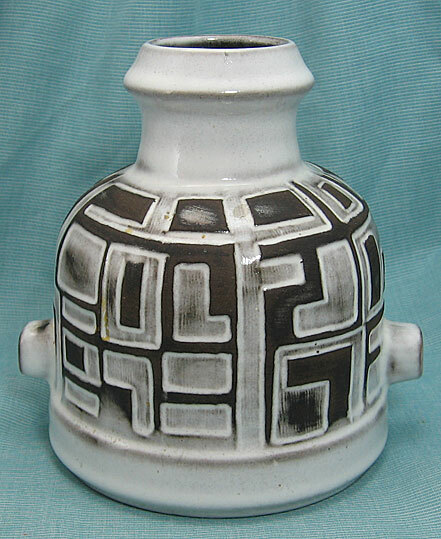 However, between labels, catalogs, and additional research more and more items have been properly attributed to ES, and many of those glazes have turned out to be some of the best for commercial W. German art pottery. 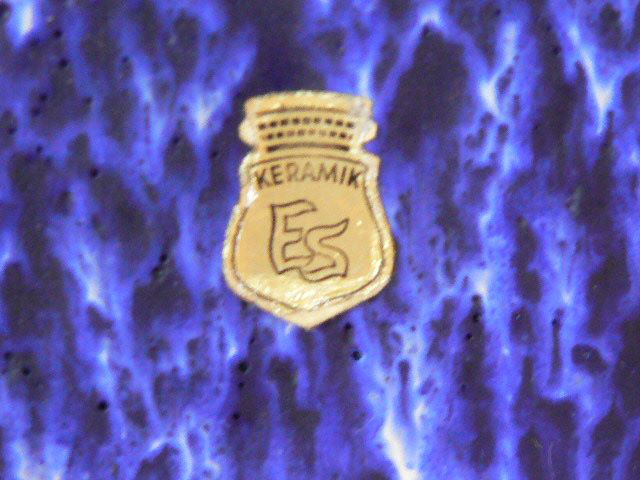 To see the ES Keramik we currently have for sale, click here. 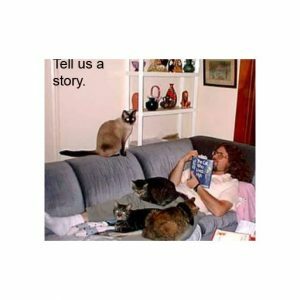 The page will open in a new tab. 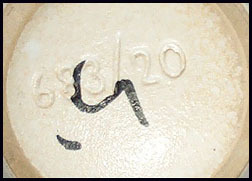 Confirmed as ES Keramik, but the base is completely blank, all too common with ES. 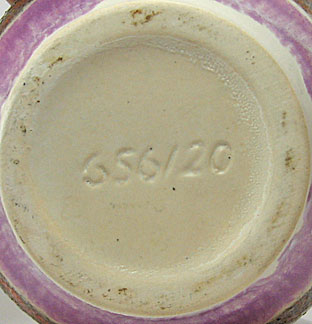 ES Keramik 689 with one of their “fattest” glazes…not uncommon on small items but hard to find on anything over 6″. 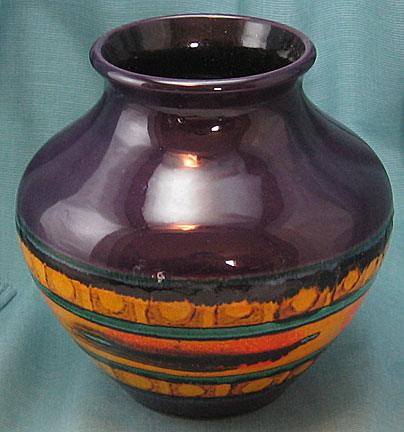 Another 683, iconic form available in many decorations/glazes. 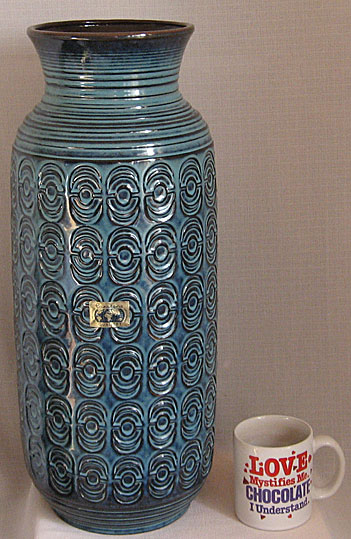 If you’re enjoying the ES Keramik gallery, I hope you’ll check out some of the other photo research galleries. 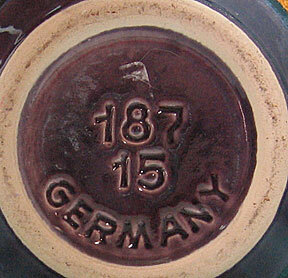 The blog has a lot of other information as well, currently mostly about W. German pottery. 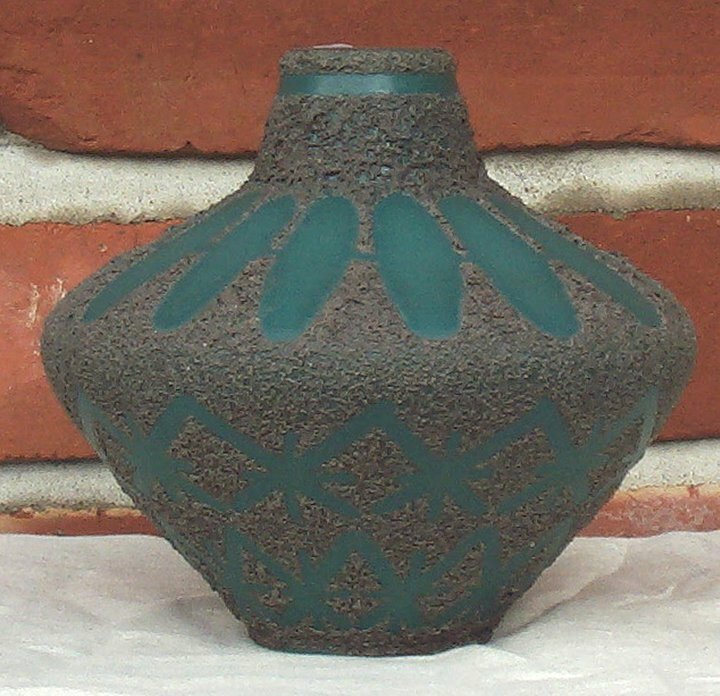 Of course, the main site also has a lot of East and West German pottery for sale along with other ceramics, glass, paintings, and odd bits. 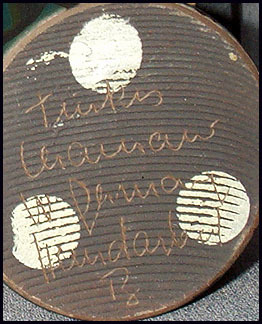 You can find your way to the home page by clicking here, rather than clicking your heels three times. Of course, you’re free to click those heels, too. Either way, the page will open in a new tab. Hope you’ll visit again and often as well as telling your friends, vague acquaintances, and complete strangers. 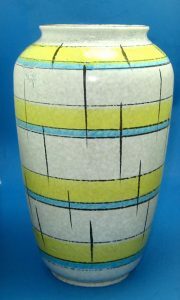 Dümler & Breiden: (1883-1992) D&B was one of the many companies in the Höhr-Grenzhausen region, and they produced an enormous range of styles over the years, from very traditional to strong Pop Art. 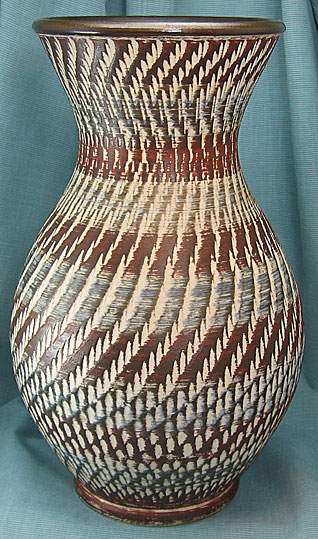 Although they most often used white to buff clay, they did sometimes use red, particularly in their Terra series and other klinker-like items. 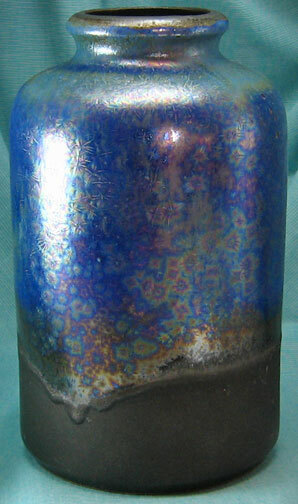 To see our Dümler & Breiden currently for sale, click here. The page will open in a new tab. 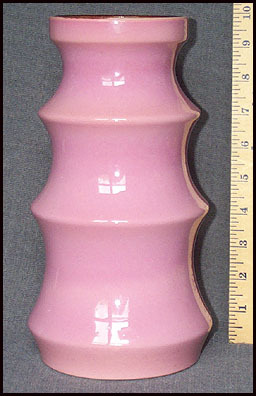 Dümler & Breiden shape 604 with what may be a variation of the Polar glaze. 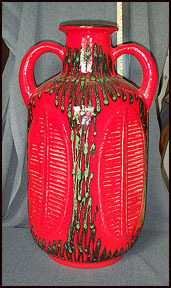 Be sure to check out the other photo galleries, blog posts, and the main site with W. German pottery, other porcelain, glass, paintings, and odd bits for sale. 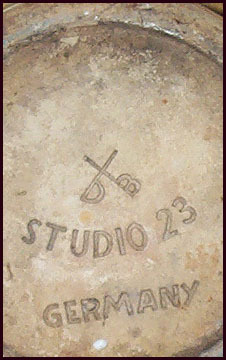 Thanks for dropping by Gin-For’s Odditiques. Please come by again, and tell your friends. Shoot, you can even tell strangers. 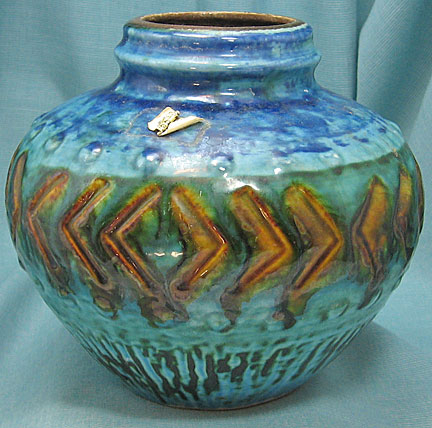 Previously sold items so people can see more of what Carstens made and learn about W. German pottery. 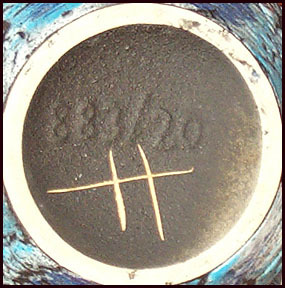 To see our Carstens items currently for sale, click here. Page will open in a new tab. Keep in mind that this doesn’t even qualify as the tip of the iceberg, hardly a hint of the tip. Also, the items here focus on the better production. 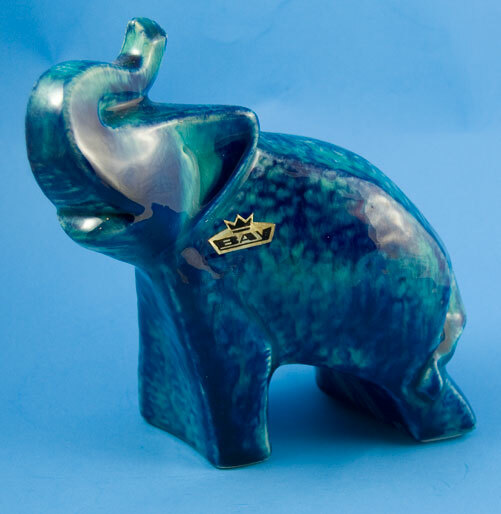 While Carstens Tönnieshof produced a lot of high quality items, they also made their share of lower end wares. 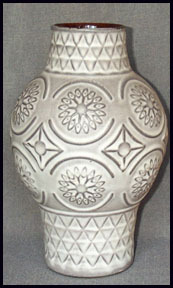 Some claim this design was influenced by the moon landing, but no one has ever produced the least shred of evidence. 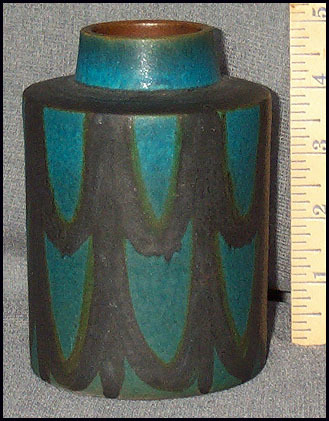 Most likely, it’s a story some collector/dealer started accidentally. 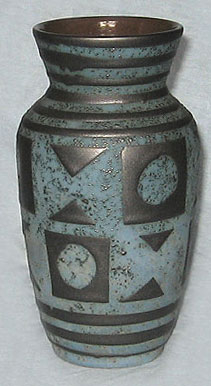 Bay did numerous items with raised decoration, floral designs, glyphs, etc. 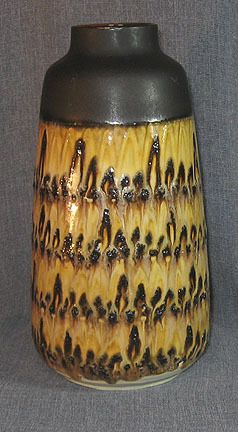 This series features symbols from Viking culture. 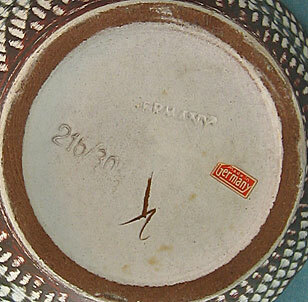 Embossed designs are often attributed to Bodo Mans, but most such attributions are inaccurate. 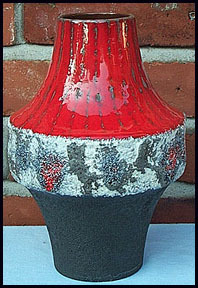 This globe-like form is found in several slight shape variations, most often in a red and white glaze combination. 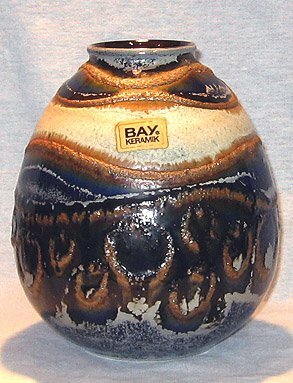 Some late Bay production was uninspired, while a few were design highlights like this. 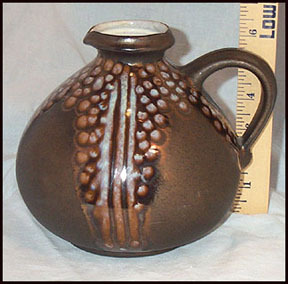 A solid glaze may not be as impressive as some others, but they were uncommon during the pre-1974 era. 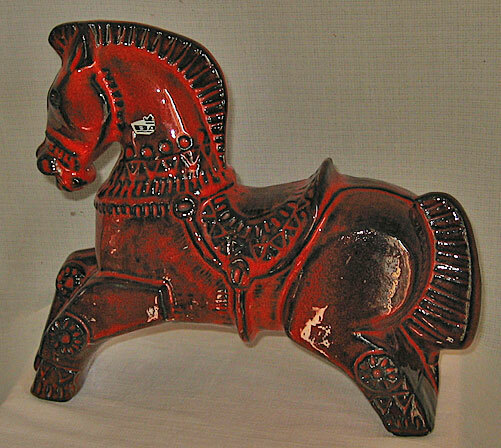 Easily mistaken for Italian work, the Bay horse is one of their better figural designs. 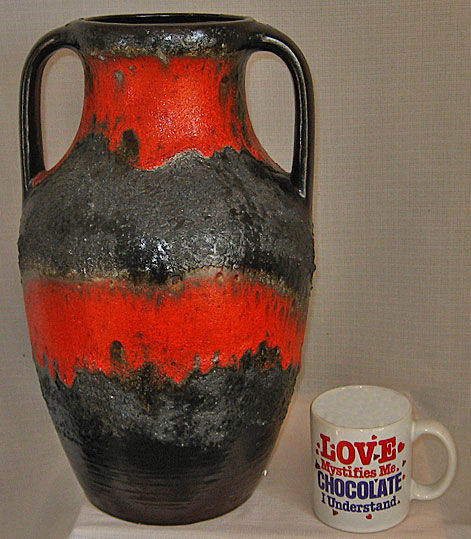 Long before most people had noticed West German pottery, a few German sellers on eBay used the phrase “fat lava” to describe the unusually thick, often flowing glazes on some items. 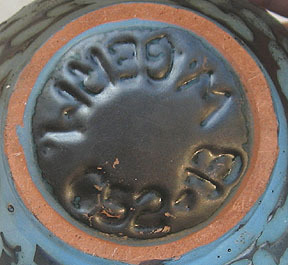 Based on that usage, the term appears to have been a slight mistranslation, shifting “thick” to “fat”, with thick meaning depth, or how much the glaze rises above the surface of the clay, not a matter of viscosity. 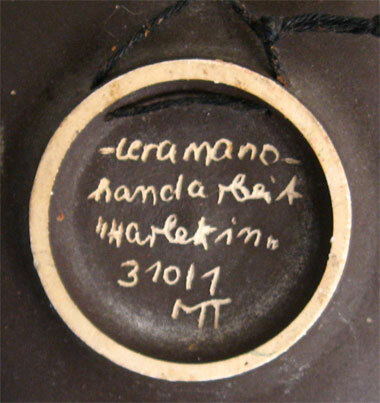 A few years later, Graham Cooley held an exhibition using fat lava as part of the title, and Mark Hill published the expanded exhibition catalog Fat Lava, which brought the phrase to wider attention, and the phrase was fun enough to catch on, perhaps too well. 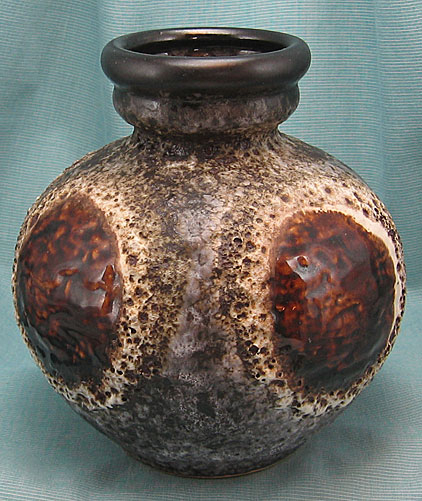 Soon, people were equating fat lava with all mid century modern German pottery, but the reality is that only a small sub-group fits the term, and many of the finest works are not fat lava at all. I’m attempting to bring a degree of regularity to the usage by defining some of the terms so we can discuss both the larger category and sub categories with more precision. 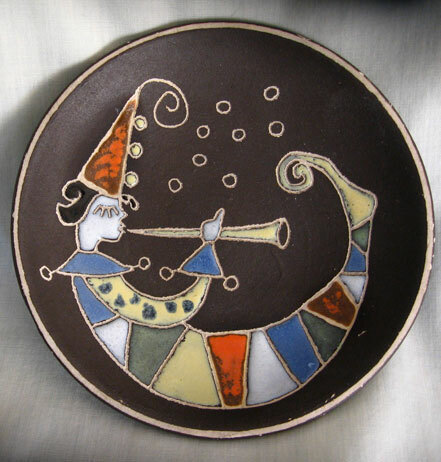 It’s rather tricky because there are a number of terms that can mean different things, and the variety in the glazes is enormous, so please be patient as I sort through the variables. 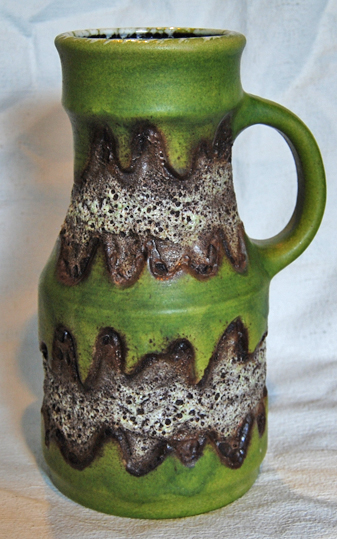 Quite often, a fat lava glaze runs down over another glaze. 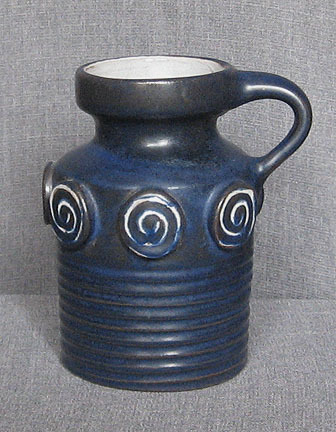 In broader terms, this is a drip glaze, and it’s been used for a long time. 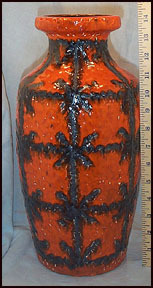 In American art pottery, drip glazes are probably best known on Fulper Pottery or some Roseville lines, such as Carnelian. 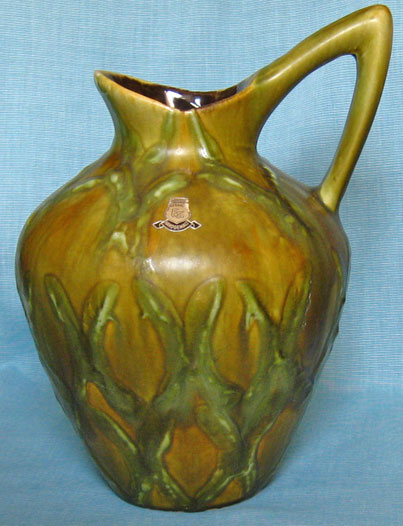 Excellent drip glazes were also done by Belgian and French potteries in the early 20th century. 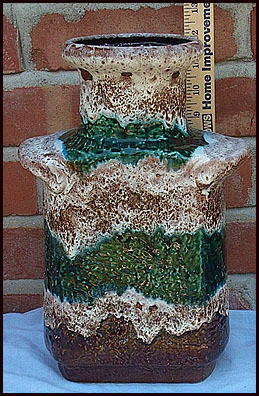 On these earlier versions, there is little or no difference in the thicknesses of the top and bottom glazes, so one type of fat lava glaze is a drip glaze, but it’s only fat lava if one of the glazes involved is “thick” enough. 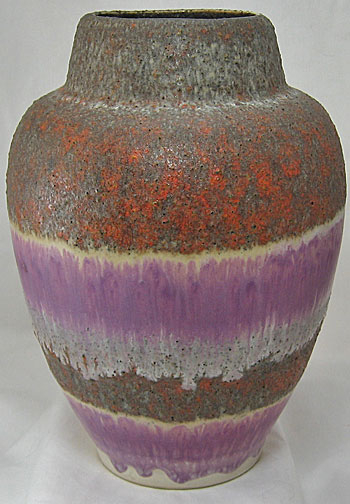 Color is in no way involved in whether or not a glaze should be called fat lava. 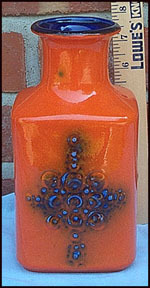 There are many fiery orange and red glazes on mid century German pottery, often suggesting the color of hot lava. 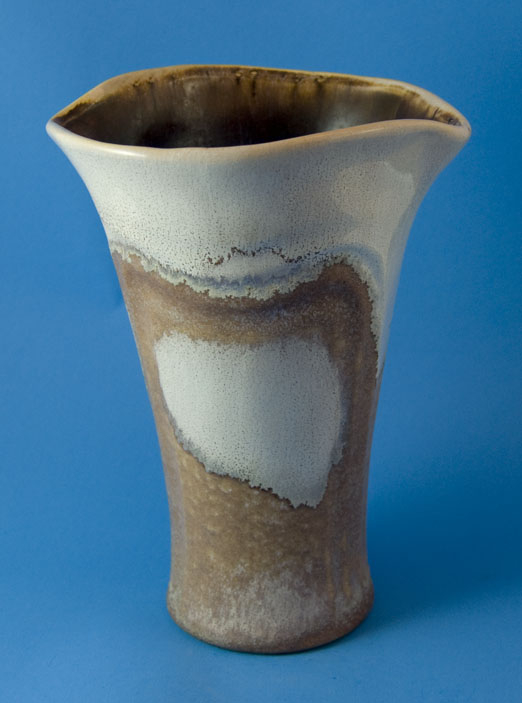 Some of these glazes have a flowing or drip quality as well, but it remains thickness that’s a defining characteristic. 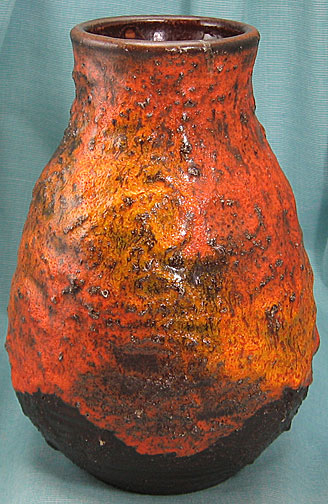 If it’s not “fat”, it’s not fat lava. 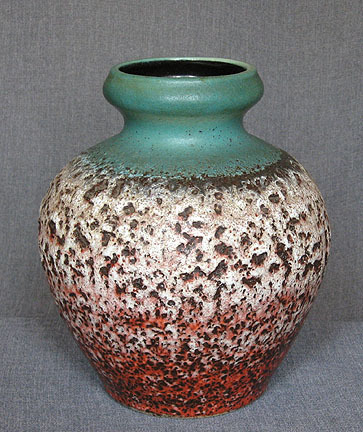 On the other hand, there are many “fat” glazes in colors that look nothing like lava, hot or cold. If we start using color as a distinguishing characteristic, then we have to start coming up with so many different names that communication becomes even more difficult than usual. So we’re better off calling a thick, flowing white glaze fat lava even when it doesn’t quite make sense in some respects. Like so many things, language is based on compromise. 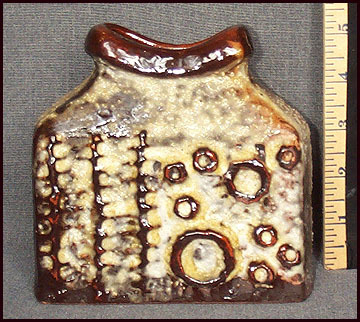 The proper use of certain ingredients can cause controlled (somewhat) gaseous explosions in the glaze, producing holes of different types. 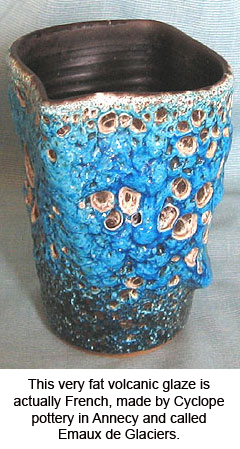 These are called volcanic glazes. 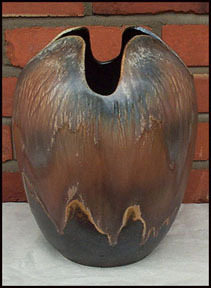 One of the best known creators of volcanic glazes is Otto Natzler, who came to the US from Austria with his wife Gertrud in 1938. 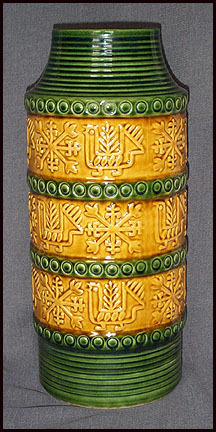 By coming to the US, Natzler was able to continue his glaze experiments at a time when all art was increasing repressed in Germany. 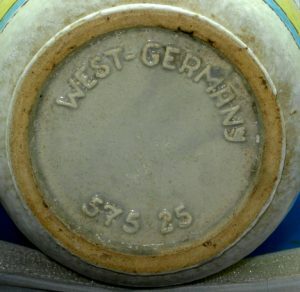 As a result of that repression and the war, it was about 1965 before German companies began producing volcanic glazes. 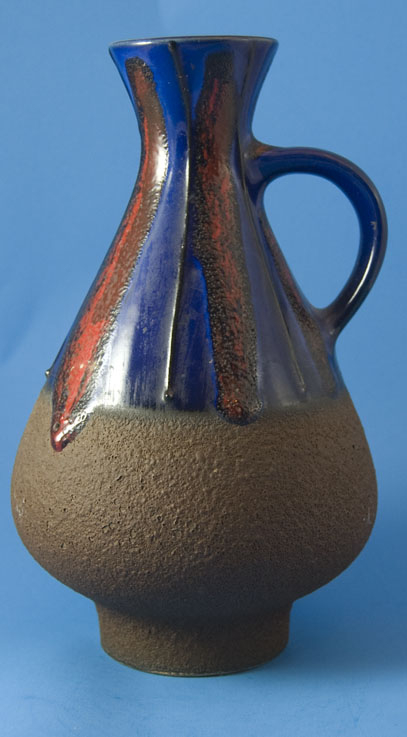 Many of the mid century German volcanic glazes are also quite thick, but it’s also possible to make fairly thin volcanic glazes (which describes most of the Natzler glazes). 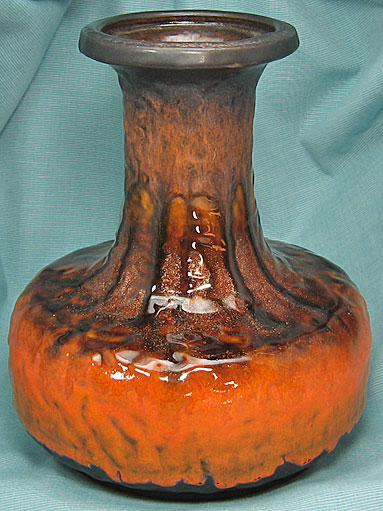 So a volcanic glaze will always be visually suggestive of lava (or the moon), but not all volcanic glazes are fat. 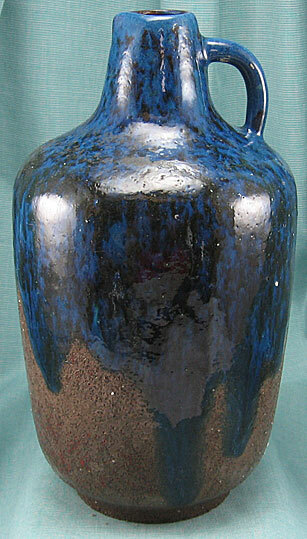 The texture of a volcanic glaze can also vary with large or small craters and sharp or smooth edges. 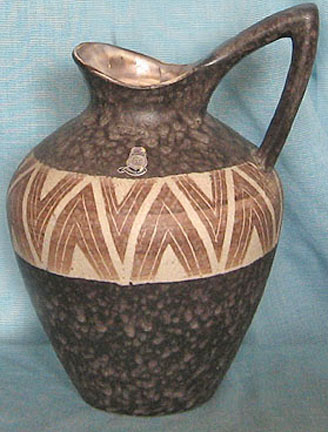 Gramann(Töpferei Römhild) made some of the best, flowing fat lava glazes, but they also made many volcanic glazes that are relatively thin with small, tightly controlled craters. 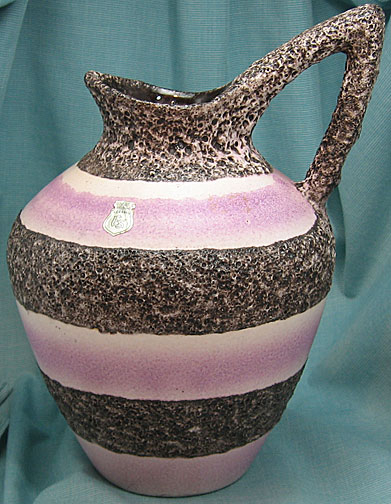 One of the most common uses of volcanic glazes is actually in applied designs, usually with a fairly fine, pumice-like glaze. 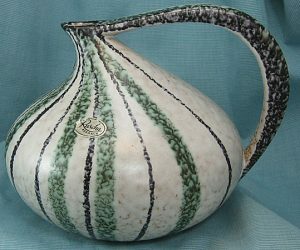 However, even though these designs are thicker than the primary glaze, the difference is often not very extreme, so whether or not these qualify as fat is variable. 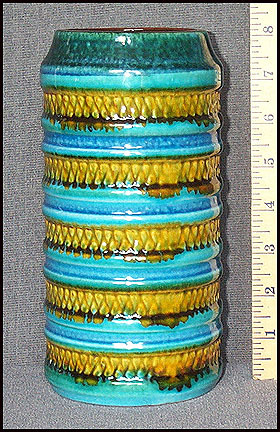 Still, since there’s no point in trying to establish a precise measurement for at what point a glaze becomes “fat”, most of them can probably be called fat lava. 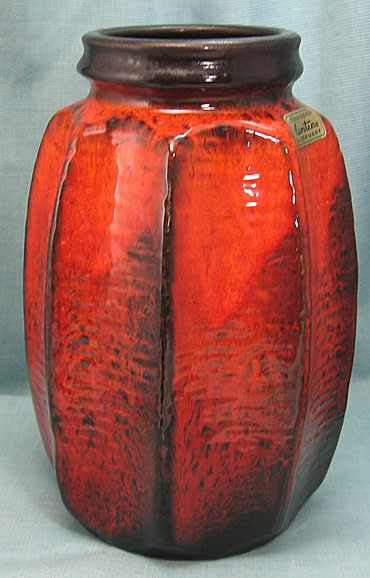 Indeed many or most of the items in the first Fat Lava exhibition and catalog were simply fat lava “detailed” with only a small part of the surface covered in the namesake glaze. I expect that we’ll eventually establish a sub-category for such items. 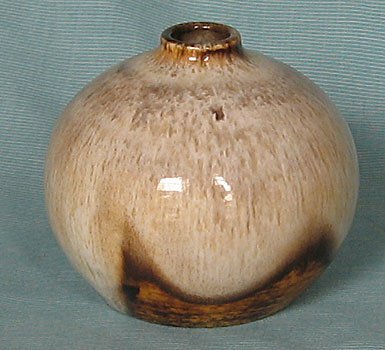 Volcanic glazes often have little or no “flow” to them, but given the texture a thick volcanic glaze should certainly qualify as fat lava. 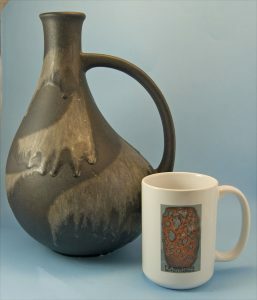 In fact, the fat lava volcanic glazes probably significantly outnumber the fat lava drip glazes, and the volcanic is probably the more accurate term, while fat lava happens to be more fun. 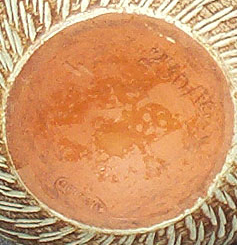 Some companies named glazes “Vulkano” (Volcano) or “Lava”, so we need to be careful with our usage and distinguish between official glaze names and the other uses of the words. 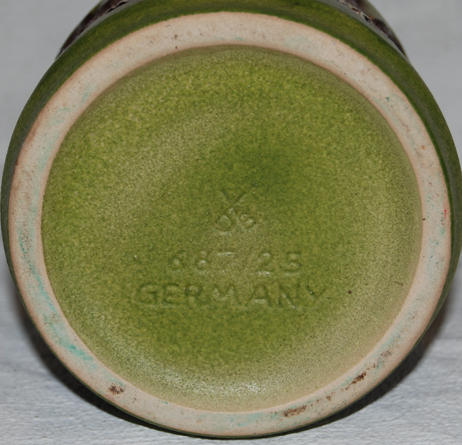 Take note that not all fat lava volcanic glazes are German. 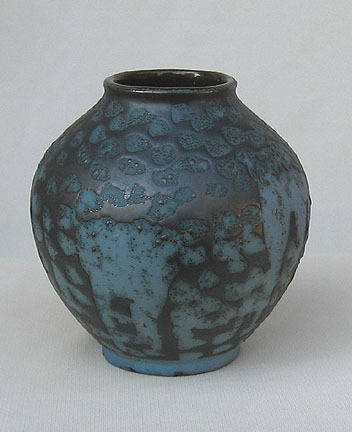 Also, there are companies that use lava pieces in the glaze or decoration. 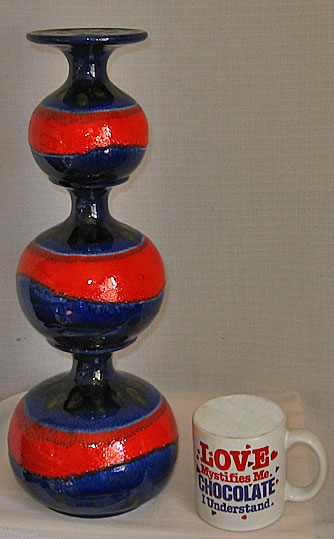 While in a technical sense these are volcanic and lava, we need to use terms carefully. 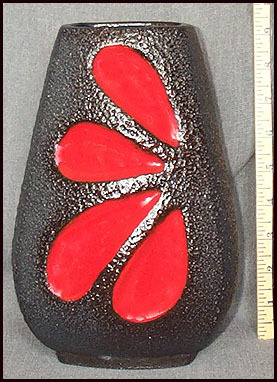 These probably shouldn’t be called fat lava, and the use of volcanic should be made clear in the context of any discussion. Obviously, my only “authority” for saying what should or shouldn’t be called fat lava comes only from observation and experience, and there will always be disagreements about language. Still, I hope this will get people to think about both what they see and what they say and appreciate the value of precision in both. The world opens up in fascinating new ways each time we learn to see a little more clearly and in a little more depth. 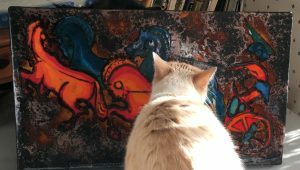 As many have said before me, the world doesn’t really exist until an artist makes us see it, but we have to learn to do some of the work when the art calls to us.